Supercars will assess cooling solutions for the SuperUtes after the category’s Balance of Performance test at Queensland Raceway. Five of the six models took to the Ipswich venue of parity testing, where running was hampered by overheating issues on a day when temperatures reached the mid- to high-thirties. The Toyota Hilux and Holden Colorado, both of which had not been on track before the test, were the worst affected. The Ford Ranger, Mitsubishi Triton, and Mazda BT-50 experienced more reliable running. The former two vehicles have run as the first prototypes for the new category, while the latter had already been driven multiple times at Queensland Raceway by Peters Motorsport, which will campaign two of the Mazdas. Supercars’ Kurt Sakzewski was among staff from the championship at the test, and told Speedcafe.com that he was confident that the issues would be resolved before cars arrive at Adelaide for the season-opener in just over a fortnight. “Today went pretty well actually, given that for both the Hilux and the Colorado really it was their shakedown day as well as the chance to do the parity test,” said Sakzewski. “We had a few issues with those cars but we think we’ve got that figured out. Peters Motorsport is understood to have already implemented cooling solutions after its initial running, but Sakzewski believed that the category could find a solution in conjunction with the supplier. “We’re working with the guys who are doing the cooling systems so there are a few different approaches to it. “We knew that was something to be aware of and certainly going to Adelaide, we know that circuit can be quite hot as well at this time of year so it was ideal today to run in these conditions. 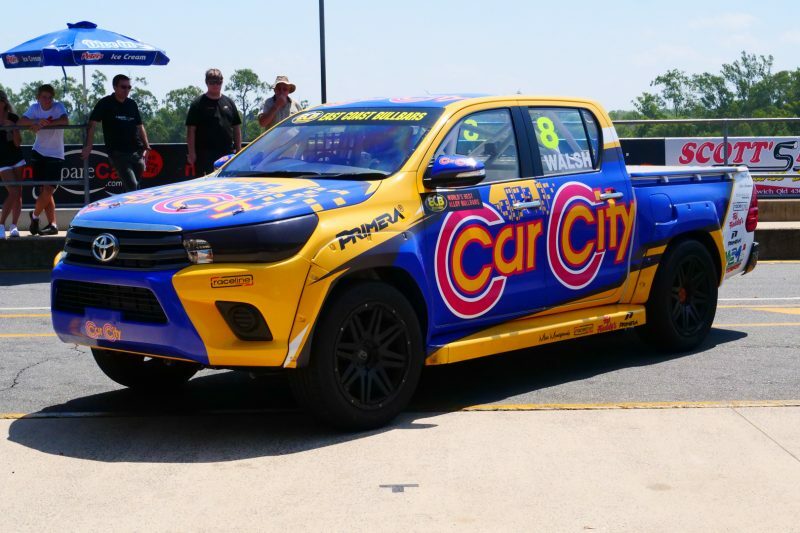 Craig Baird, Steve Owen, and former V8 Utes driver Stephen Robinson cycled through the five cars during the day before a number of competitors took to the circuit. Track time was scarce throughout the day with most cars limited to runs of two laps at a time due to the heat, while the Hilux and Colorado were hampered further by turbo problems. Sakzewski said that there will be further testing at Queensland Raceway prior to Round 1, during which time more parity work will be conducted. “We’re looking at the issues but it does appear that it was a turbo on both those cars so we’ll go and do our homework,” he added. “We got the Colorado running again so the guys at Craig Hasted’s shop (Engine builder) will be working on that in the next couple of days. The Isuzu D-Max, which will also be homologated to be raced by Steve Wilson, was not present as it awaits completion. It is expected to hit the track mid-next week and will be run against another of the models once a baseline for parity can be established. The ECB SuperUtes Series begins at the Adelaide 500 on March 1-4.